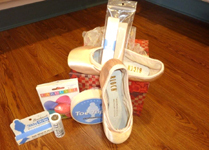 The Dance Shop is located on the premisies of VBTS. We carry dancewear and accessories from major manufactures such as Bloch, Bodywrappers, Capezio, Danskin, Sudanca and others. 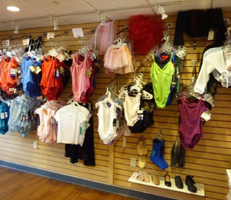 Come in and browse our selection of ballet leotards, tights, slippers, skirts, tutus, sweaters, legwarmers, and shorts, in all sizes. We also offer dance bags, necklaces, hair supplies, scrunchies, ballet books, ballet videos and lots of other wonderful dance related items. Special Shop hours in Essex and Shelburne for all of your dance needs.